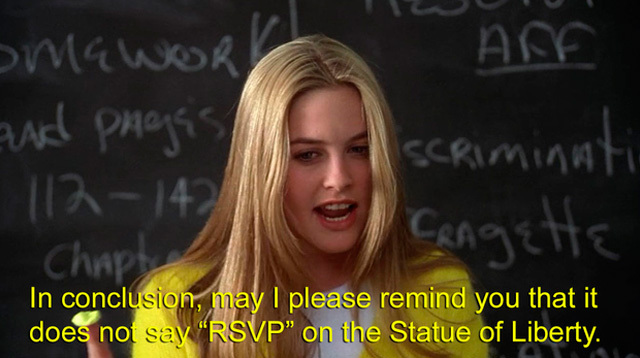 Along with boy bands and a young Leonardo DiCaprio, Clueless is easily one of the best things the ‘90s gave us. The movie, which follows Beverly Hills high school student Cher Horowitz (Alicia Silverstone) as she strives to help people in her adorably ditzy way, is filled with relics from that glorious decade, among them baggy pants, mini backpacks, and humongous cell phones complete with antennas. But besides offering a snapshot of teen life in the ‘90s, this cult classic continues to be an enduring force because the joys and misadventures of Cher and her friends remain relevant no matter what decade we find ourselves watching it in. 1. Find friends who truly understand you. “She's my friend because we both know what it's like to have people be jealous of us,” Cher says of her BFF, Dionne (aka Dee). Snobbery aside, commonality is always a good basis for choosing friends. 2. A true friend will call you out when you make mistakes. Or at the very least, question your fashion choices the way Cher did with Dee’s Dr. Seuss hat. Learn from Cher, who practically trademarked the whole plaid-short skirt-knee-high socks combo. “Never accept a first offer.” Thanks to this nugget of wisdom from her litigator father, Cher is able to wheedle teachers into giving her better grades. 5. Be a go-getter even when people don’t expect you to. For all her “superficial space cadet”-ness, Cher is a goal-oriented gal who doesn’t just rely on her looks to get by. 6. Being in love makes people kinder. After some masterful matchmaking by Cher and Dee, Mr. Hall and Ms. Geist fall in love, their students start getting higher grades—everyone’s a winner! 7. Use your gifts for a good cause. Cher and Dee use their popularity, fashion sense, and makeup skillz to transform clueless newcomer Tai in one of the most satisfying movie makeover montages ever. 8. Helping others is its own reward. “’Tis a far, far better thing doing stuff for other people," Cher quotes, totally mangling the original line from Charles Dickens’ A Tale of Two Cities. But yeah, you get the idea. 9. When your boyfriend does something stupid, threaten to call his mom to smack some sense into him. Hey, it worked for Dee when Murray had his head shaved. 10. You can’t tell someone who to date. Keep the whole Cher-Elton-Tai-Travis love disaster in mind the next time you try to force some random guy on a friend who clearly has her heart set on someone else. 11. Stand up to sexual harassers. 12. Be vigilant when out at night alone. Cher could’ve looked for a safer place to make that call on her cell phone to avoid getting held up at gunpoint (and ruining her Alaïa dress). 13. It’s okay to be picky about the men you sleep with. “I’m just not interested in doing it until I find the right person,” Cher says of her decision to stay a virgin. “You see how picky I am about my shoes, and they only go on my feet.” PREACH. 14. There’s nothing like a near-death experience to bring loved ones closer together. Or in this case, there’s nothing like a freeway scare to make Dee’s virginity go from technical to nonexistent. 15. Gay guys make great friends. Cher may have lost a potential boyfriend in Christian, but she gained a good friend, a shopping partner, and a teacher of all things #ahrt. 16. The perfect outfit has ~power~. 17. Shopping might not solve your problems, but it will make you feel better. Just knowing that you’re doing something to take care of yourself—yes, buying clothes that make you look bomb is taking care of yourself—propels you forward from your sorrows. 18. When a friend apologizes, don’t prolong the tension and just kiss and make up. Tai delivered the burn of all burns when she told Cher, “You’re a virgin who can’t drive.” But once she apologized, it was all water under the bridge for the two friends. 19. The right man might be under your nose all this time. 20. It’s okay to date outside the box. Don’t be afraid to date someone other people wouldn’t normally approve of. To hell with the haters and go date your ex-stepbrother if that’s what makes your heart soar! 21. Paul Rudd is the ultimate #AgingGoals. Paul Rudd in Clueless in 1995 doesn’t look that much different from Paul Rudd in Ant-Man in 2015. WE WANT WHATEVER PRODUCT HE’S USING.